What Does Code P0498 Mean? The emissions profile of your car includes CO2 (carbon dioxide), which is directly related to fuel economy, and others, such as NOX, CO, and HC (oxides of nitrogen, carbon monoxide, and unburned hydrocarbons). 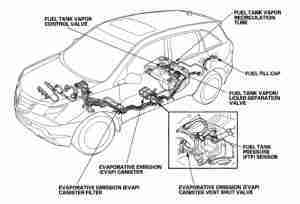 Additionally, even when the car isn’t running, it may also be responsible for evaporative emissions, that is, fuel vapors. The warmer it is, the faster fuel evaporates, which is great inside your engine, but not so great in the environment. 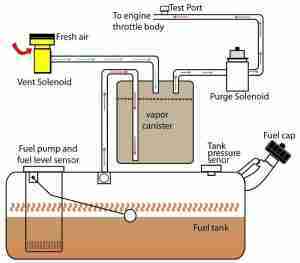 The Evaporative Emissions Control System, typically referred to simply as the “EVAP” system, is designed to capture fuel vapors and route them to the engine, where they can be burned. The EVAP system includes an activated-charcoal canister, for storing fuel vapors, tubing connecting the canister to the fuel tank and the engine intake. At least two valves are used to control the storage and flow of fuel vapors, such as the purge valve and the vent valve, and pressure sensors are used to verify system operation. The ECM (engine control module) controls and monitors the EVAP system. While purging the charcoal canister, for example, the ECM will command the purge and vent valves to open. 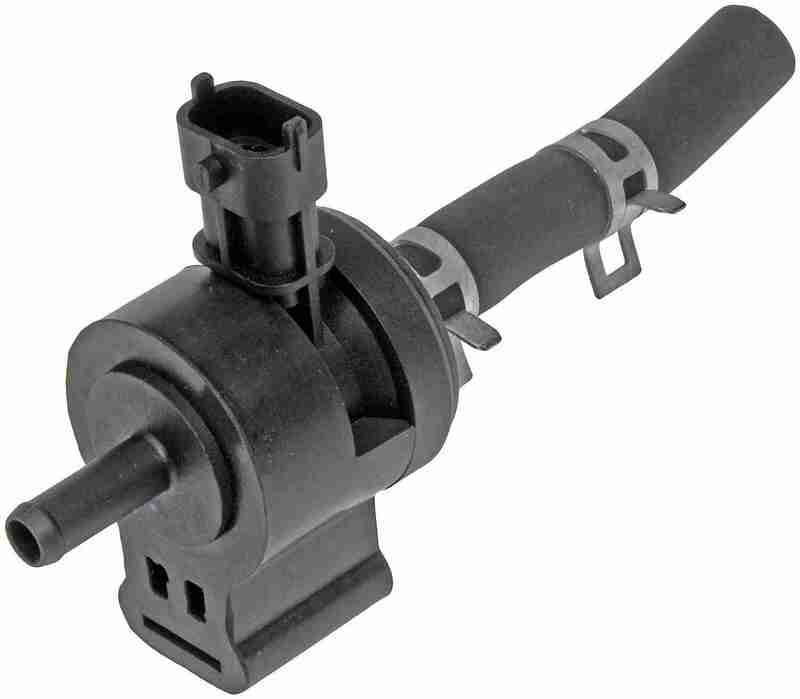 Engine intake vacuum creates a partial vacuum in the EVAP system, while fresh air enters the vent valve, flushing out fuel vapors to be burned. At the same time, using voltage drops and pressure readings, the ECM monitors EVAP system function. If the ECM detects a problem in the EVAP system, it will set a DTC (diagnostic trouble code) and illuminate the MIL (malfunction indicator lamp). In case the ECM detects a problem in the vent valve circuit, it will set DTC P0498, “Evaporative Emission (EVAP) System Vent Valve Control Circuit Low,” and illuminate the MIL. Depending on the automaker, the vent valve may be called the canister close valve (CCV) or vent shut valve. What are the common causes of code P0498 ? Depending on year, make, and model, DTC P0498 may have number of causes. Here are some of the most common. Honda – A number of Honda vehicles, including Element, Civic, and Accord, have reported faulty vent shut valves. Replacement usually fixes the problem. 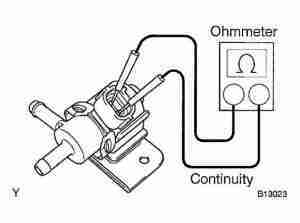 However, always finish circuit diagnosis before condemning the valve itself. Damage – Rodent damage is very common for electrical issues. Because much of the EVAP system is exposed, including the CCV, nesting animals often figure your wiring is in the way, requiring their removal. Be on the lookout for nesting materials and droppings, which may point you in the direction of the electrical fault. What are the symptoms of code P0498 ? Aside from the MIL, there are typically no associated drivability problems. Depending on the automaker’s specific failure mode, you may notice reduced fuel economy and a slight performance loss. How do you troubleshoot code P0498 ? 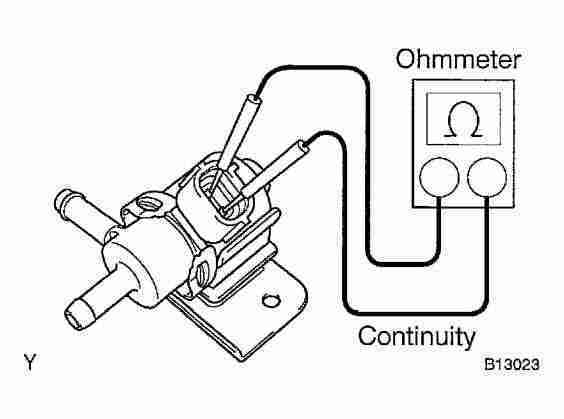 Because DTC P0498 refers to the CCV circuit, you will need a DVOM (digital volt-ohm meter) and a repair manual or electrical wiring diagram to evaluate the circuit between the ECM and the CCV, as well as the valve itself. Depending on how easily accessible the ECM and CCV are, you can start your diagnosis wherever is easier. From the ECM side, you can perform an overall circuit check, including the CCV, by disconnecting the ECM and testing for resistance across the appropriate terminals. The typical solenoid valve measures between 25 Ω and 35 Ω at room temperature, but you should check your specific repair manual to determine the proper resistance value. While the ECM is disconnected, check for resistance to ground on both the power and ground sides of the CCV circuit. Both should be infinite resistance (open circuit) to ground. Incorrect Resistance – If you measure resistance higher than specification, say 40 Ω to ∞ Ω, suspect corrosion in the connector, a broken wire, or a faulty CCV. If you measure resistance lower than specification, 0 Ω to 20 Ω, suspect a damaged wire harness or faulty CCV. Check the wiring harness for broken or chafed wires and check the CCV connector for bent or broken pins or corrosion. Repair as necessary. Check the CCV – Disconnect the CCV and measure the resistance directly across the terminals, between 25 Ω and 35 Ω at room temperature. If you measure outside this range, replace the sensor. None found. Ask a question about P0498.